The Tom's Hardware Intel CEO Draft: Who Should Lead Team Blue? It's been almost seven months since former Intel CEO Brian Krzanich resigned from the company, acknowledging a relationship with an employee and leaving the company without a chief executive. Chief financial officer Bob Swan is temporarily holding the post, but has been vocal about not wanting the job full-time. Intel is reportedly looking to fill the post soon, hopefully ahead of its Jan. 24 earnings call. So some of the Tom's Hardware staff got in Slack to hold the first ever CEO draft. It was a two-round snake draft, so each participant got two picks. It was taken seriously. Mostly. Here's what went down. This chat has been slightly edited and condensed for clarity. Andrew E. Freedman: Good morning all, and welcome to the Tom's Hardware Intel CEO draft! Intel is rumored to be announcing a CEO ahead of its next earnings report, on Jan. 24. Let's pick who it should be. To start, I'll enter all participant names in alphabetical order (by last name) into an online randomizer. That will produce our pick order. We'll do a two-round snake draft, giving everyone a top pick and a backup pick. Then we'll vote on who has the best options. Who you think Intel may pick. Whether that would be a good pick for Intel. Please briefly explain your picks. Now... let's start the randomizer! Andrew: So Zak, whenever you're ready, give us draft pick number one for Intel CEO. Zak Storey: Well then, my pick is Jim Anderson, current CEO and president of Lattice Semiconductor, ex General Manager and Senior VP of Computing and Graphics business group at AMD during the Ryzen uprising, and ex Intel employee from 97-05, also selling Axxia business to Intel back in 2014 for $650 million. The rumors of Intel poaching Lisa Su, although a good fit, don’t sit well in my gut. I’m convinced she’s more committed to AMD beyond being there just for the pay. Bringing AMD back from the brink under her leadership shows exceptional talent and commitment to the company. Jim on the other hand has extensive experience at AMD during that Ryzen uptick, and currently works for a smaller semiconductor company, along with that extensive experience with Intel in the past, it makes him a very attractive solution to Intel’s problem. Would it be a good pick for the business model? I’m not entirely certain, but I’ve no doubt his open and honest managing style would be good for the consumer, and help to bring a bit of transparency back to the company. Scharon Harding: I'm going to go with Cristiano Amon, president of Qualcomm. Amon has been rumored to be on the shortlist for Intel's next CEO, and I think he has a good chance. The exec has been at Qualcomm since 1995 and has worked with Intel's current chief engineering officer, Murthy Renduchintala, when he was at Qualcomm. Amon was also previously co-president and SVP of QCT, in charge of wireless chips and has worked at various mobile companies, like Ericsson. With a strong background in chips, mobility and engineering and ties to a high-level Intel exec, he's a good contender. Andrew: For those not in our Slack channel, Matt just gave that a little thumbs-up emoji. I think he suggests that's a good pick. I see Paul Alcorn is shaking in his boots with the third pick. Paul Alcorn: Dr. Murthy Renduchintala hails from Qualcomm, where he was the head of the company’s chip development programs. Renduchintala joined Intel in 2015, and as the group president of the Technology, Systems Architecture & Client Group and chief engineering officer, is now in charge of Intel Labs, the Manufacturing Group, Systems Architecture as well as the Client and Connectivity businesses. Renduchintala served as the key recruiter for Raja Koduri and Jim Keller, and then oversaw the shaping of Intel’s new cohesive vision that spans all facets of its operations. Together with the company's leadership, the three identified six key building blocks that the company would focus on over the coming years. Intel has traditionally promoted from within, and Renduchintala's success with the company, combined with his outsiders’ perspective, makes him a natural fit for the role. His deep interaction on plotting the new course forward assures solid execution of the company’s goals, and his educational background (bachelor’s degree in electrical engineering) is a good fit for Intel’s tech-centric culture. Scharon: I think Zak's pick for Anderson is a good shot, especially considering the oh-so-desirable successful merger and acquisitions capabilities demonstrated by the Axxia sell he mentioned. He surely has plenty of Team Blue friends as well. I think Paul has a point regarding appointing from within. But it's been so long since they've been CEO-less, and they've had such headaches with previous leadership that I think they may be eyeing a new strategy. Andrew: This may be too newsy of a pick, but it makes a lot of sense: Johny Srouji, who is rumored as of this week to be on the shortlist. He's vice president of hardware technologies at Apple, where he's been since 2008 working on the A4, Apple's first system on a chip. The company's A-series processors in the iPhone and iPad are truly impressive, and there's rumors that his team may be able to bring about some Macs using Apple's own processors rather than Intel's. If Intel poached him, it could be a big win for them. He's the type of CEO who could likely help them out with their manufacturing issues and bring about some innovation. He may also be good for relations with vendors that use Intel's chips. Of course, he's likely being paid very handsomely at Apple, so... I could see him playing hard to get. But Srouji has a history at Intel. He worked at its Israeli design center for many years before jumping to IBM and then to Apple. Paul: Andrew stole my second pick! Avram Piltch: My pick is Renee James, CEO of Ampere Computing and former Intel president. Intel needs a new, enthusiastic face to bring positive attention to the company as well as someone who has a history of delivering results. That's James. I've read that she's out of the running, but if true, that's a mistake. I covered Intel extensively when James was president there and her charisma and natural leadership ability was evident in every presentation she gave. While she was there, Intel had a lot of success maintaining pace with Moore's law as well. But in addition to a reputation for getting things done, James would bring some much needed swagger and showmanship to the role." Scharon: I like the idea of Intel gettin' its swagger back, that's for sure. Andrew: Matt, you're up. And because you're the end of the first round and beginning of the second, you get two picks! Matt Safford: I’m taking the cynical approach. Judging by what I've seen from past CEO performances, I think they'll hire some established high-level corporate exec who has little or no real tech background. Then within months they’ll make a big acquisition of a competitor that will generate lots of headlines, but in the long run will only create more problems for the company. Within a couple years, that "new" CEO will leave before any of the real problems get solved, trailing a golden parachute behind them. Andrew: To be clear, your pick is "empty corporate suit." Matt: If I have to pick an actual person, I'll go with a candidate who I actually think would be a very good choice for Intel's future: Sanjay Jha. Until last March, he was head of Globalfoundries, so he has experience overseeing a massive fab. Before that, Jha was co-CEO of Motorola, which would make him a good fit for Intel's aims to be a big part of the 5G landscape. And until 2008, he spent 14 years at Qualcomm, leaving as COO. This also fits well with Intel's continued mobile and low-power aims. With Jha at the helm, Jim Keller handling CPU architecture and Raja Koduri steering development of the company's much-hyped upcoming Xe graphics, Intel would have a proven trifecta of chip leadership it needs to turn back toward silicon innovation and leadership. That said, $200 billion companies, much like luxury liners, take a long time to right their course. Even with Jha, I think AMD has at least a two-year window to continue to gain market share and innovate. When the blue team turns itself around, it's going to be facing stiffer competition than it has in decades. Andrew: Good pick. (Stole my second choice!) And now we're onto Avram's. Avram: Jonney Shih. More than anything, Intel needs a showman, someone to bring the brand positive attention. 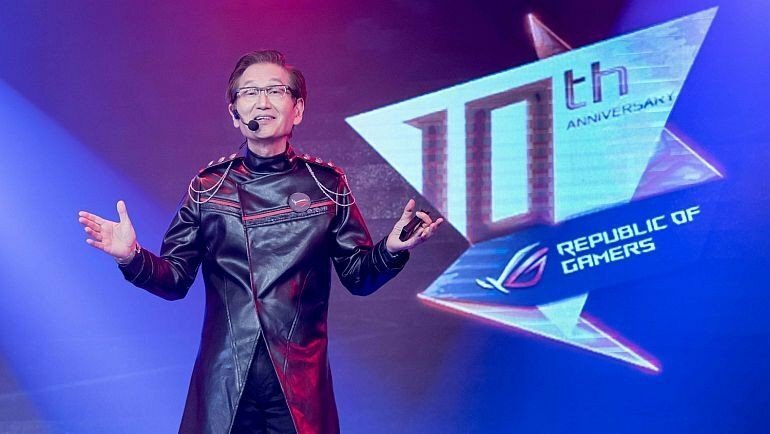 That person is Asus Chairman Jonney Shih, unarguably the greatest presenter in tech today! It's hard to put into words the contagious enthusiasm that Shih brings to crowds at Asus events. You just have to see it for yourself. Shih could sell baking soda and make it sound exciting and innovative. He also has 40 years of tech industry experience. At Asus, he said he was in search of incredible. At Intel, he can say he found it. Paul: His presentations are amazing, and just what Intel needs. More yelling! 10nm, isn't it incredible?!?! Scharon: I've never seen this guy present before. This is amazing. I love him. Paul: You have to experience it in person to truly appreciate it. Matt: If it's Jonney, then he needs to wear the leather jacket to everything. Scharon: He's like a superhero! Or Matrix person. Matt: The shoulder chains really make that outfit. Andrew: Well, it's back to me. I'm going with Diane Bryant. She was an early pick that seems to have fallen off the radar. She was president of Intel's data group and left under Brian Krzanich's reign. Before that she was Intel's chief information officer. She was integral to the company selling chips to corporate clients. She also spent some time on Google Cloud as COO, though she wasn't there very long. She's on Broadcom's board these days, but I think if they could get her into Intel's corner office, she'd be a great face for the new Intel. Scharon: Stole my pick! I knew you were going to. I almost said it earlier. Andrew: I also like Bryant because while she spent a lot of time in Intel's culture, like most of its CEOs, she's seen some other experience. Paul: I think she is a long shot, but not as long of a shot as Lisa Su. Andrew: Well, Paul, who's a better pick? It's your choice now, after all. Paul: Navin Shenoy, Intel’s current executive vice president and general manager of the Data Center Group, has piloted Intel’s data center group (DCG) to record revenues. Shenoy also served as the head of the company’s PC and tablet business units, meaning he has a deep understanding of Intel’s two key revenue-driving segments. Shenoy, along with Murthy Renduchintala, has been on several of Intel’s recent earnings calls, which is widely thought to imply that the two are front-runners for the CEO position. Shenoy represents a conservative and safe pick for Intel. His long tenure at the company, which began back in 1995, and good reputation among employees make him a solid internal candidate. Andrew: Very good pick. I considered him. Intel likes people in it's ranks (see: every other CEO). I think his part of the CES press conference was an audition. The ball is now in Scharon's court. Zak: Super happy with my second draft. Andrew: You wait your turn, sir. Scharon: This is a long shot and more of a “fantasy” pick. Ginni Rometty, CEO of IBM. Intel and IBM have a lengthy relationship, including in key market areas, such as servers and the rapidly growing Internet of Things space. So Rometty should have a good understanding of Intel’s current strategy, as well as well as its hopes for the future. Paul: I like Rometty, she is certainly a visionary. Good pick. Andrew: I think she may be very hard to peel away, though. Avram: That's a great pick! Andrew: And last of the picks, before we review, is Zak. Zak: I'm going to preface it with this. If Intel’s in dire need of the theatrical I can’t think of a better second pick than Steve Ballmer, ex-CEO of Microsoft. Legendarily famous for his enthusiasm, and his overthetop press conference performances, having him come out of retirement and on board as Intel’s CEO would be nothing but entertaining as far as the press is concerned, and hopefully breathe a little bit of life into the stiflingly corporate face of Intel. The similarities between Intel and EA’s business practices would be long gone that’s for sure. Would he be good for team blue’s long term business strategy? Well that depends on your point of view, like many others on this list he does have a long history in mobile, if he had the team and the technology surrounding him, there’s no doubt they could likely make something glorious out of it all. Personally I just want to be at a press conference where he’s shouting 10nm and clapping repeatedly, over and over and over again. Andrew: You and Avram, man, going with theatrics. Avram: 10nm, 10nm, 10nm! Zak wins! Avram: Putting the Win in Wintel. Also, Steve Balmer would bring back the IDF [Intel Developer Forum] show, because he loves "developers, developers, developers". Who has the best pick and backup? Andrew: My vote goes to Paul. If I could pick a second it would be Scharon. Paul's picks are safe, inside Intel (Intel inside?). Scharon's are great picks, but I don't see a chance. Matt: Zak, I think before making this pick you should have messaged @Avram Piltch after his Jonney pick and said "hold my beer." Zak: I’m down with Jonney for obvious reasons. But yeah genuinely I think Murthy’s going to nail it. That's a vote for Paul. Avram: Scharon's picks are best for Intel probably. Matt: I vote for Zak's Balmer pick. I just hope he doesn't have a heart attack on stage. Andrew: Oy vey. Scharon? Paul? Scharon: I vote for Paul. Wait I'm switching! Matt: Has Scharon been influenced by Russian bots? Scharon: I'm voting for Avram. While one of his picks is a throwaway, I think Renee James is a good pick. Andrew: Sucking up to the boss! Scharon: Nah it's the bots. Andrew: Paul, please for the love of god finish us off. Paul: Andrew, on the strength of his first pick. Scharon: Ugh no I'm back to Paul. I forgot Renee just started her own company. It's not a vote if there's no drama!! Matt: Like most of Intel's processors. Avram: These takes are so hot, you won't be able to use the stock cooler. Andrew: Congrats to Paul Alcorn, winner of the Intel CEO Draft. Now we wait to see if any of us were actually right! Thanks for playing! Matt: Don't worry, Intel has water chillers at the ready. What did you think of our picks? Who had the best choices? Would you pick someone different? As always, let us know in the comments. Raja Koduri... this way Intel will never recover. Lisa Su. AMD should take over Intel. She is uniquely qualified in that she has the most thorough insight into Intel. Intel is more deeply troubled than commonly acknowledged. I think Intel poaching a different company's CEO to lead them is a very unreasonable expectation unless they wish to tank even faster. Imagining Lisa Su would give up on AMD to lead Intel is just plain silly. It's hard to find a more fulfilling role in life when you're in such position than she has now, and it's about much more than money at that stage, unless you have reached CEO position solely through politics, not skill and commitment, and are insecure regarding your abilities. She is an engineering lead at heart and knows she wouldn't get the same fulfillment or respect for leading Intel. I think she's committed to AMD, unless she ever feels AMD stopped wanting her, which doesn't seem to be the case. They are 90% likely to hire from within at Intel. Unless nobody's up to the task, then they will hire externally and fail further. To succeed, Intel needs a technical manager from within to lead them, someone who truly understands the engineering work that they're capable of from within. It's a complex company with plenty of hidden talent, sinking while their core is sleeping on many opportunities. You need to know it inside out to turn it around. Their largest mistake was becoming a large excel sheet rather than a tech innovator. I think Intel poaching a different company's CEO to lead them is a very unreasonable expectation unless they wish to tank even faster. Imagining Lisa Su would give up on AMD to lead Intel is just plain silly. It's hard to find a more fulfilling role in life when you're in such position than she has now, and it's about much more than money at that stage, unless you have reached CEO position solely through politics, not skill and commitment, and are insecure regarding your abilities. She is an engineering lead at heart and knows she wouldn't get the same fulfillment or respect for leading Intel. I think she's committed to AMD, unless she ever feels AMD stopped wanting her, which doesn't seem to be the case. They are 90% likely to hire from within at Intel. Unless nobody's up to the task, then they will hire externally and fail further. To succeed, Intel needs a technical manager from within to lead them, someone who truly understands the engineering work that they're capable of from within. It's a complex company with plenty of hidden talent, sinking while their core is sleeping on many opportunities. You need to know it inside out to turn it around. Their largest mistake was becoming a large excel sheet rather than a tech innovator. History shows that rejuvenating a corp with insiders fails more frequently as with outside talent. That they have not found anybody inside till now...means there are none willing or none capable. Both scenarios are likely and both scenarios mean Intel is not reformable. The only person that managed a turnaround of a PU conglomerate is...Lisa Su. Why not getting the best? Intel is just more of the same. Intel lacks products that have broad appeal. Pricing is off. AMD should take over Intel. We all would love to see the lemonade stand kid buying Coca Cola, but that's not going to happen. I'm not sure what sort of moral compass they need. They aren't the Peace Corps. They are an engineering firm and manufacturer. They just need to be able to drive the engineering department to build ever better, faster, more efficient, &c computer components than the competition at competitive prices. Then let their other departments do their jobs to get the product out and make deals with OEMs. While following applicable laws. False equivalency. TE 1:60. TTM 1:15. Its feasible. Not sure if it would make sense now since AMD has a great lineup and Intel is covering spiralling costs with pricehikes on mostly outdated and unreformable products. In a few years the scenario odds will increase. "We all would love to see the lemonade stand kid buying Coca Cola, but that's not going to happen." Tfw the lemonade stand has the recipe for come and makes it taste better, have less sugar, and sells it cheaper. Oh and it doesn't melt the enamel off your teeth. Pat Gelsinger - best possible choice. Knows Intel inside and out plus experience at EMC & VMWare. Pat Gelsinger - best possible choice. Knows Intel inside and out plus experience at EMC & VMWare. So true, but he announced that he wasn't interested so we left him out of the draft. Lisa Su is just riding the Ryzen wave, she isn't some miracle worker like everyone believes. Ryzen and its marketing is really the only thing keeping the company afloat, the graphics department is in shambles and its showing, and they have little no reach in all of the other profitable ventures like deep learning, AI, etc. Did you see their budgets? Sure, the Zen cores are a miracle of engineering considering what they had to work with. But they had to neglect GPUs in the process to make it happen. Considering how little development time was likely dedicated in that area, they are still doing fine. They have Vega on 7nm as a temporary patch and Navi in the works. Moreover, they will have Sony and Microsoft consoles again. They are doing excellent considering where they were when Lisa Su took office and she made better choices than I assumed were even possible back then. Sure, their engineers, Jim Keller and the resulting Zen helped, but she steered them there and did everything well to make these chips sell. She's an excellent CEO, and she represents the company amazingly well. She's loved by the enthusiasts as well, considering she never lost touch with them and the engineering side of things, as opposed to Intel over the last decade. I don't think we could've asked for more of her or if there's anything that she could've done but didn't considering where AMD was when she took it over. At the time, I was afraid AMD might never return to their former glory and we might never see any good architecture in the mainstream from them. They are doing great, and it's only getting better for them, as they are recovering. Surely it's much more than just CEO's job, but she's doing her part pretty much flawlessly. But not as a move from AMD to Intel. She should run both! Ouch, somehow having to retrieve my password turned into a double post. Seriously, I hope they don't go after Lisa Su. She's the medicine that AMD has needed for decades. 7nm, superior scalability and the renewed spirit of innovation is the sauce that gives AMD a leg up at this time. It's good to see, after being tromped on via Intel FUD for so many decades.